Begin training your dog the very first day you get him. The first training lesson is teaching your Chihuahua to do his business outside. As soon as your Chihuahua is successfully housebroken, you can then begin teaching him other commands. Providing him with treats and plenty of praise when he follows your commands to keep him happy and let him know he’s pleasing you. 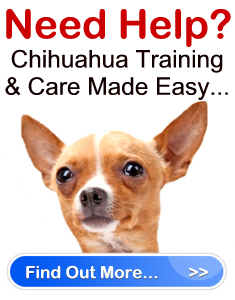 Keeping Chihuahua training sessions short so as not to bore your dog and lose his attention. When you train you need persistence. This means not letting your guard down for a moment as you train your dog. Your small Chi will try every trick in the book to ignore you, not follow your command or encourage you to play instead of teach. You must show your dog who is boss. Use one-word commands. Don’t confuse your dog when teaching him a command by giving him a phrase or short sentence. For instance, instead of saying “Come here”, say in a firm, gentle tone “Come” followed by your dog’s name. Have authority in your voice when giving commands – Your dog needs to know you mean business when giving a command. Therefore, you should give all commands in a firm voice, in a tone that is slightly louder than normal. Do not aggressively discipline your dog while you are teaching him. If your dog does not follow your instructions, tell him “No” gently, and do not give him a treat. Then start from the beginning, and take it slower until he understands. Furthermore, keep in mind that if –for instance – you told your dog to “Come” and he ends up knocking over your plant on the way, do not yell at him or scold him for this action. Praise him for coming to you, because he followed the command. You want your dog to associate the action he has committed as a good thing. He won’t understand why you are upset with him for doing what you asked. After housebreaking, the second command you should begin with is “Sit”, followed by “Stay”, “Come” and “Down”. Once your dog has successfully mastered all of these basic commands, it’s then up to you whether or not you would like to teach him more. Chihuahua training is not for the lazy. All commands you teach your dog must be constantly reinforced until he understands them as easily as he understand when he is hungry. As sweet as your Chi is, you must show him whose boss or he’ll walk all over you.